VATICAN CITY (CNS) — Helping the church get the Gospel message out to the digital world depends more on a loving passion for reaching out to others than being tech savvy or a verbal warrior, Pope Francis told Catholic communicators. Despite the temptation that exists today, dialogue and bringing people to Christ have nothing to do with hounding others into submission in a kind of “theological brainwashing,” he said. The pope’s comments, which included a number of off-the-cuff remarks, came during a special audience with participants of the Pontifical Council for Social Communications’ plenary assembly meeting Sept. 19-21 at the Vatican. The discussions focused on the church and digital communication. In a world of rapidly changing methods of communication, “the issues are not principally technological,” the pope said. Some people “sometimes feel let down by a Christianity that to them appears sterile and in difficulty as it tries to communicate the depth of meaning that comes with the gift of faith,” the pope said. “What (Pope Francis is) doing is he’s touching the hearts of people, and the world has stopped and the world is listening,” said Basilian Father Thomas Rosica. “We have a great temptation in the church today” to engage in “spiritual harassment, the manipulation of conscience, a theological brainwashing,” which, in the end, he said, only leads people to an encounter with Christ in name only and not with the living person of the Lord. 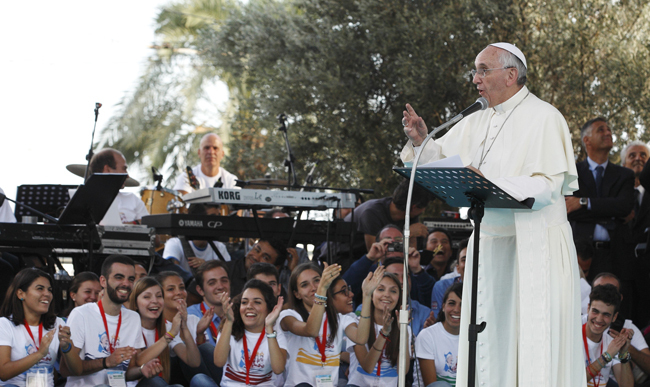 Meeting Christ involves the living Christ and the individual experiencing the encounter, “not what’s wanted by the ‘spiritual engineer,’ who wants to manipulate people,” the pope said. “Are we up to the task of bringing Christ into this area and of bringing others to meet Christ,” he asked. People are searching for the “precious treasure” of the Gospel, which brings light and hope to a world that often lacks meaning, direction and purpose, he said. Communicators need to portray “the face of a church, which is ‘home’ to all,” and convey the beauty of faith and joy of meeting Christ. “Thorough and adequate formation” is key, he said, because religious and lay Catholic communicators need to be able to venture into the darkness of indifference without losing their way; “to listen to (people’s) dreams without being seduced; to share their disappointments without becoming despondent; to sympathize with those whose lives are falling apart without losing our own strength and identity,” he said. No matter how outdated or inadequate the tools, God loves people so much that he “wants to reveal himself through the means at our disposal, however poor they are, because it is he who is at work, he who transforms and saves us,” he said. The pope ended his talk by asking for people’s prayers “because I have this mission, too,” of communicating Christ to the world. “The digital world is in many ways very abstract, and it can be isolating and disorienting,” he said. While it has many benefits, people cannot forget that human beings are meant “to be in relationship, personal relationship” with others. The priest said the pope’s success in making the media pay attention does not stem from studying communication theories. “He didn’t hire an ad company or a public relations firm, he is communicating with his person, the credibility of his person, the gestures, the desire to be with people,” Father Rosica said. The pope “has put a lot of us to shame because we can spin our theories, but as long as we continue to do that without establishing human relationships, all of our efforts are in vain,” he said. “What he’s doing is he’s touching the hearts of people, and the world has stopped and the world is listening,” said the priest. “We have to live the faith in a very authentic way and a very physical way. We can’t just write encyclicals about it, we just can’t issue documents about it,” he said. However, this personal approach is not new to Christianity, “it’s really the witness of the Gospel, the Acts of the Apostles, so maybe we have to keep rediscovering this,” he said.